As you may know, I only have ONE subscription box. However, AdoreBox approached me to try their's and I couldn't resist. 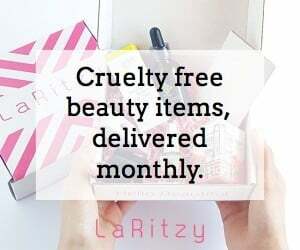 They have a "monthly beauty and lifestyle box", "2x monthly beauty and lifestyle box", and a "quarterly premium beauty and lifestyle box" which is what I got. So for my box the total value ended up being right under $140. I got 10 full sized items. Some brands I had heard of, others I hadn't. There was a good mix of higher end things and drugstore, which I personally really like. They also sent me some coupons as well which I thought was very cool, and I will put them to good use. You get an insert of what everything costs along with a note that if you don't like something you got in your box you can trade it on www.eDivv.com. There was nothing in this box at all that I was disappointed with, I was actually super impressed with everything. I really liked how there wasn't only makeup and skincare, there was a gift card for jewelry, and breath mist, nail polish and press on nails (which I love), and more. I liked everything in it and I've been using a lot of the products already. The only thing I had tried before was the Kiss imPress Press-On Manicure. I actually have another box of these on stand buy because I love press on nails, trust me they've improved people! So I knew I would like those already. I've been using the Cetaphil wipes like CRAZY. I was so glad they were in the box. I also used the 5 Minute Beauty Peel from Dermasilk, because I've been doing so much Halloween makeup with body paints that my skin needed some help and I really enjoyed that as well. It wasn't crazy intense (let's get real you see the word "peel" and it gets intimidating) and my skin was super smooth afterwards. I've been using the Lashsculpt ever since I got the box because I have very thin and fine lashes and I'd always wanted to try a serum but, other than some DIY serums I made, I never had. So, I've been using that for about 2 weeks. If it goes really well, I'll do a full review on it. Like I said though my face has been having a harsh month, thanks to constant scrubbing to get off makeup, and my lashes have been taking a beating as well. However, I do notice that they don't seem to be as affected as they usually are during the Halloween madness, so maybe this is strengthening them. We shall see. I carry the fresh breath mist with me in my purse, as well as the Korres Lip Cooler in Raspberry because I'm obsessed with the Lip Cooler. It has a metal ball at the end of the wand which is what cools your lips and it's just the coolest (no pun intended) thing I've seen in a really long time. That's difficult to say most of the time because after a while everything is kinda redundant in the beauty world. Things are still exciting because you know they'll be great but not often do you see stuff that's very exciting because it's brand new to you, and something you've never seen before. Like I said I'm just super impressed by this box. I can't wait for the next one in January, because remember mine is a Quarterly box. I saved the best information for last though because you can use code "HALFOFF" and get 50% off your purchase, pretty sweet right? If you are looking into a subscription box, then I strongly urge you to look at adorebox. They are far better than any subscription box I've seen as of yet.